If you follow this blog regularly, you may have read about my ol’ friend Dietrich. Next month he will celebrate a special birthday. So far so good. But he has a special wish – he doesn’t want any presents except some musical presentation on stage of the venue – if you can and if you want. Um. I have a special handycap when it comes to notes and rhythm – although I love music and my knowledge on temporary music may be well above average. Okay, no more swagging from now on. 😉 I can’t sing, dance or play any instrument – even if I try to clap my hands in rhythm it doesn’t take long and it rather sounds as a kind of applause. You must know that Dietrich is a multitalent, he can play more than a hand full of instruments, is a master on the guitar (plays Knopfler and Santana like a champ), he can draw and design (what is is actual profession), and supervises CGI-services for international movie productions (for insiders: knows L.A. and New Zealand). On the other hand he is a very humble and friendly chap and an extremely good and trustful friend. So I don’t want to disappoint him (although I know that he wouldn’t blame me for not singing, dancing, playing). But last month an idea started to grow in my head. For more than a decade we have been together on photo trips around the globe. When on vacation photographers often shoot behind the scenes how the other photog takes an image. One day I put these kind of shots in a separate category and called it “The Photographer at Work”. Until now this our working title for this kind of photos. Why not making a very personal photo book with a selection of the best shots? The first two attempts to produce this book unfortunately failed. The first failure was my fault: I was too excited and didn’t do a proper proofreading. The second was the book company’s fault – they used the wrong paper. 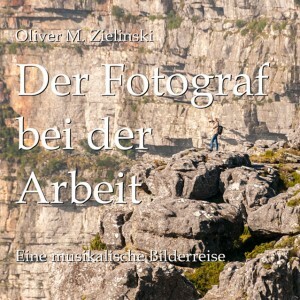 In my third attempt I turned back to Blurb and produced the book directly from Lightroom – and was satisfied again. When I handed the book to Dietrich we had a lot of laughs and remembered great times we spent together. Dietrich takes all what it needs to make a good photo. Here at Laguna Seca race track on a Champ Car weekend. With hundreds of tourists under Julia’s balcony in Verona (left). Doing some landscape shooting at the Oder floodlands in Germany’s East.